Here in the United States, most folks—save my fellow history nerds—know those words thanks to V for Vendetta. While I’ll grant you that Hugo Weaving’s recitation in the film version is wonderfully dramatic, it takes on a whole new flavor when you know about the contents of the rest of the folk poem. Specifically, the meaning changes quite a bit as you read lines about killing the Pope—arguably a stand-in for any and all Catholics looking to overthrow the Protestant monarch of the time and install a Catholic king or queen on the English throne. Basically, the long and short of it is this: Guy Fawkes was a member of a group of men that, today, would be considered religious terrorists and that poem celebrates the foiling of the Gunpowder Plot, as well as the deaths of the conspirators. Disturbing though it may be on the whole, I do agree with the poem’s assertion that “the Gunpowder treason should [n]ever be forgot.” So, in that vein, here are five other things you may not have known about Guy Fawkes Day. The focus of the Gunpowder Plot was the State Opening of Parliament, an event that marks formally marks the beginning of the parliamentary session and is attended by most, if not all, members of the House of Lords. Additionally, part of the formal ceremony is an address by the reigning monarch. By making State Opening the target date, the Gunpowder Plot conspirators were hoping to bring down the current monarch—King James I—and politically connected nobility that could stymie attempts to put a Catholic royal on the throne. State Opening of Parliament in the House of Lords, though, had originally been planned for January 1605. It was delayed numerous times thanks to the Plague. “Remember, remember whatever day in January” just doesn’t have the same ring to it. Despite the day’s being referred to as “Guy Fawkes Day” (in addition to Guy Fawkes Night, Bonfire Night, or Firework Night), Fawkes was not the plot’s mastermind. He was mostly brought on board as the explosives guy—think Basher in the Ocean’s film series. Fawkes had extensive military experience and was fervent in his belief that a Catholic monarch should wear England’s crown, but his name being inextricably linked to the mass assassination attempt is more a product of his having been the first of the conspirators caught. Moreover, he was found under Westminster Palace with the gunpowder. Eventually, though, all twelve of his co-conspirators were either caught or killed in the process of being apprehended. How much damage would have been done if Fawkes successfully ignited the gunpowder? When Fawkes was discovered in the undercroft he and his compatriots leased beneath the House of Lords, he was found with thirty-six barrels of gunpowder. That equals somewhere in the neighborhood of fifty-five hundred pounds of explosives, enough to cause significant structural damage to all buildings within a radius of sixteen hundred feet. Westminster Palace and Westminster Abbey would have been utterly decimated. Even buildings in Whitehall would have sustained serious damage. Well, maybe. It seems some experts are claiming that the gunpowder may have decayed—it had been sitting in that undercroft some five to six months—to the point that it may not have packed the anticipated explosion had it been ignited. 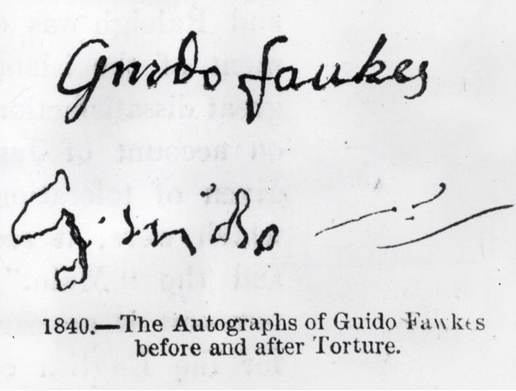 In fact, he held his resolve for quite a while, even earning King James I’s admiration—though, admittedly, that admiration did not dissuade the Crown from authorizing Fawkes’ torture. Though there are no records listing exactly what methods Fawkes endured, the signature comparison above hints at some of the damage done to him over the course of a few days. Though his forced confession did lead authorities to his co-conspirators, there are also elements of his confession that do not bear out; he confessed to the group having tried to dig a tunnel under Westminster, but no evidence of such an endeavor has ever been unearthed. In fact, Fawkes, himself, could not later locate the tunnel. For all his fervor where it came his faith and the political power he felt it should wield, Fawkes was actually born and raised into a Protestant family. He did not convert to Catholicism until he was well into his teens. To claim and practice the Catholic faith in Elizabethan England was incredibly dangerous. During Queen Elizabeth I’s reign, Catholics were routinely persecuted—in fact, scores of priests were imprisoned, tortured, and executed. When Queen Elizabeth died and her nephew, James I, ascended to the throne, many English Catholics held out hope that the new king, though a Protestant, would be more tolerant of their faith—James’ mother, Queen Mary of Scots, was Catholic, after all. It did not take long for their hopes to be well and thoroughly dashed. It was in this context—an atmosphere of brutal religious repression—that the Gunpowder Plot was hatched. While attempting to murder the King of England and as many members of the House of Lords as possible is decidedly not the right way to handle it, I can only imagine the degree of terror and trauma felt by English Catholics at the time as they watched their priests and missionaries marched to the gallows. It is certainly not surprising that there would be any number of peaceful, political, and—yes—sometimes violent attempts to fight back at their persecution. So, on Guy Fawkes Day this year, please do remember, remember. Remember that—however awful the actions—there were deadly serious reasons for the plotters to hatch a treasonous terror attack. Remember that the State was not blameless. Remember that repeated and ongoing state-sanctioned brutality will be met with resistance—and that resistance might not be nonviolent in nature. And, above all, remember that there is a whole lot of history—and bigotry—that culminated on that fateful fifth of November. Sweatpants & Pop Culture | Happy Birthday, LeVar Burton!